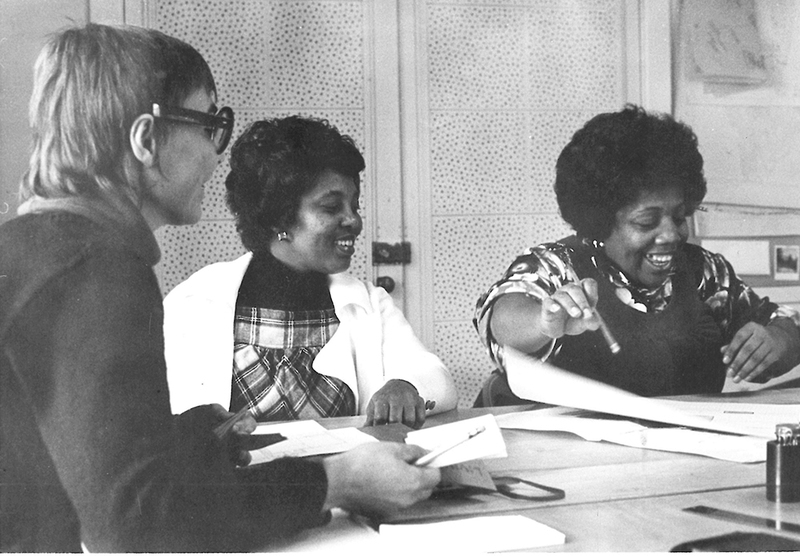 In 1978, three women engaged in a conversation about the role women professionals could play in changing women’s lives. Within 16 months, they had started a business: the Women’s Development Corporation. 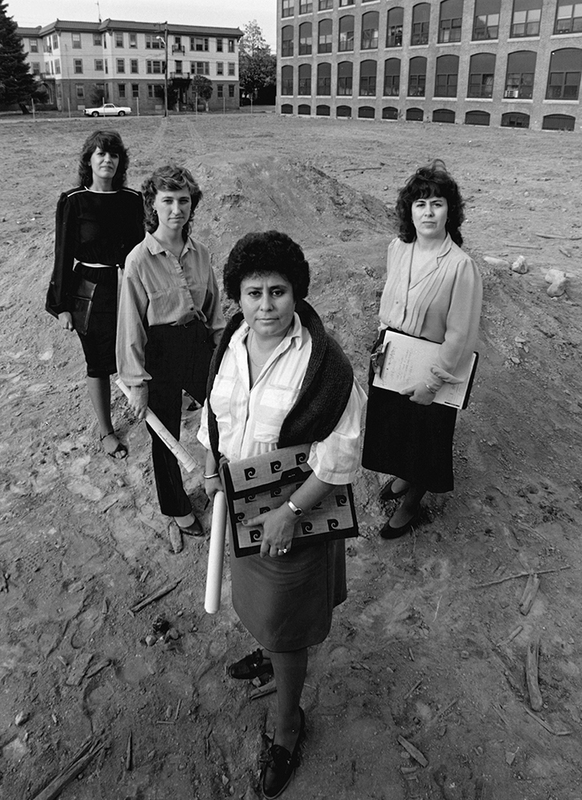 Katrin Adam, Susan Aitcheson, and Joan Forrester Sprague were coordinators of the Third Session of the Women’s School of Planning and Architecture (WSPA), held in August 1978 at Roger Williams College (today Roger Williams University) in Bristol, RI, a program focused on design by and for women. They soon met and invited Alma Felix Green to join them, a former employee of the Providence mayor’s office with ties to the local community. The WDC exists today as one of the largest nonprofit housing developments in Rhode Island, developing scattered-site, low-income housing, with an emphasis on community investment and a participatory design process. Over nearly 40 years, they have provided housing for between 9,000 and 10,000 people. 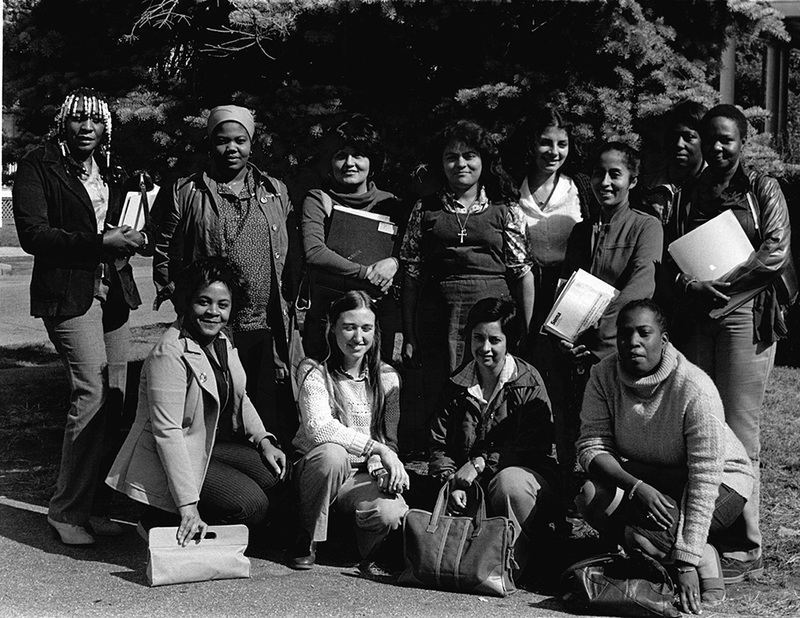 In the early years, the WDC focused its efforts on Providence’s Elmwood, then “a multi-ethnic neighborhood in which more than half of the residents are single, widowed, or divorced women… [with] the state’s highest percentage of families receiving welfare payments.” At the outset, the organization also sought to help support and empower community women professionally, in addition to providing housing opportunities. They organized workshops to teach women how to go into business—how to get help from the Small Business Administration, plan a business, sell services to the government, and so forth—as well as training women to be eligible for employment as carpenters’ and painters’ apprentices in the construction industry. The WDC provided transportation and child care for these programs, as required. This emphasis on self-empowerment was and is critical to the mission of the WDC, originally serving a client group of marginalized women by offering “a chance for stable housing within a support system network that encourages independence and self-sufficiency.” Today, they also build alliances with elderly, disabled, veteran, and homeless communities. The WDC addresses a number of social issues in their developments. First, they seek to tackle the stigma of low-income housing that leads many communities to resist such development initiatives. They rehabilitate triple-decker houses, transforming existing buildings into multiple apartments in scattered-site plans that blend into the neighborhood. The WDC manages the properties themselves to ensure that the housing will be taken care of, maintaining a good reputation for low-income housing. Second, according to Aitcheson, they “thought it was very important to try to be sure that the housing is responding to the people who live in it… So we spent quite a bit of time in participatory design process where families could tell us about where they live and why they live and how they live.” Taking direct input, they designed spaces intended for single mothers: a standard plan of three- and four-bedroom apartments has more, smaller bedrooms to allow for greater privacy alongside a shared open space, visible from the kitchen, to facilitate group play. Substantial storage spaces significantly ease quality of life, while parking directly in front of the unit and small, fenced-in backyards with lighting address security. Finally, since opening their doors in 1979 the WDC has held a commitment to building environmentally conscious, energy efficient homes. In the 1990s, when it had become the largest producer of low-income housing in the state, the organization expanded this emphasis on environmental conservation to historical preservation. They joined forces with the Providence Preservation Society to address affordable housing and the preservation of endangered historic homes in the inner city. The high costs of preservation standards can make it prohibitive to maintain buildings in low-income neighborhoods, resulting in the destruction of turn-of-the-century structures. The WDC bought, renovated, and managed historical houses as low-income rental properties, protecting the buildings as well as the neighborhood itself, preventing gentrification and displacement. 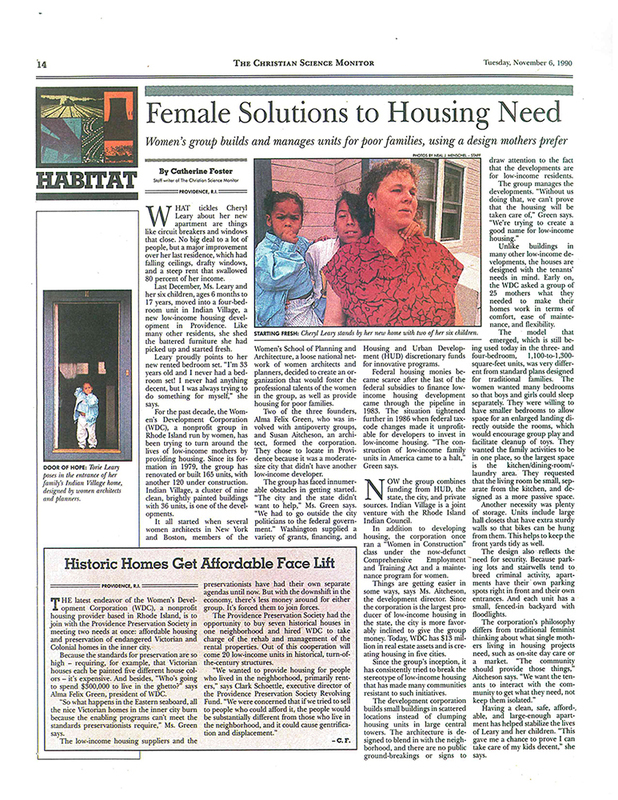 “Female Solutions to Housing Need” : The WDC has received press from a variety of publications ranging from architecture magazines to national newspapers. This article focuses on the personal experience of a family living in new WDC housing. ~ Source: Catherine Foster, The Christian Science Monitor, November 6, 1990. 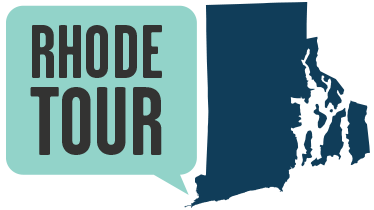 Allison Pappas, “Women Building Buildings for Women,” Rhode Tour, accessed April 23, 2019, http://rhodetour.org/items/show/259. Adam, Katrin, Susan E. Aitcheson, and Joan Forrester Sprague. “Women’s Development Corporation.” Heresies #11, special issue “Making Room: Women and Architecture,” vol. 3, no. 3 (1981): 19–20. “Housing Options.” Design Media Research Lab, Vimeo, https://vimeo.com/33722124. Accessed 30 July 2018. A Guide to the Women’s Development Corporation Records, 1979-2015 Women’s Development Corporation Records Ms2016-012. http://ead.lib.virginia.edu/vivaxtf/view?docId=vt/viblbv01839.xml. Accessed 30 July 2018.